Getty/Stephen BrashearAmazon Go now operates six stores in three cities. 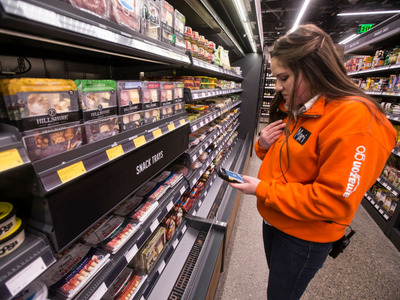 There are now six Amazon Go stores in existence, located in Seattle, Chicago, and San Francisco. Four out of the six stores are closed on the weekends. New data from InMarket shows that the peak time for Amazon Go store visits is around noon, meaning the stores are more lunchtime destinations. The visitation data combined with the store hours and assortment suggests Amazon might be leaning into that model. Still, the Amazon Go format has already proven to be flexible, with the different stores varying in size and offering different products. Don’t try visiting most Amazon Go stores on the weekends. Four out of the six Amazon Go stores currently open in Seattle, Chicago, and San Francisco do not open on either Saturday or Sunday. It makes sense that Amazon Go would not be open on the weekends,according to new data from InMarket, which used location data from mobile apps to track visits to the stores. For the five stores it included in its report, the peak time for Amazon Go store visits is around noon. The analysis was conducted over a 60-day period, concluding on October 22. Weekday visits are much more common than visits on the weekend. Wednesday is the busiest day, followed by Thursday. That means customers are likely using the stores as a lunchtime, weekday grab-and-go option. Amazon Go’s customer visitation patterns are more like a convenience store than a grocery store, but it has aspects of both. The visitation data combined with the store hours and assortment suggests Amazon might be leaning into the prepared-food model, but it’s likely Amazon will tinker with that as Amazon Go expands and the company is able to test it in more markets. The Amazon Go store format has proven to be flexible, with the different stores varying in size and products. The stores even have different operating hours in different parts of cities. Amazon Go is also successful in other areas, including having an above-average rate of customer retention of 44%, and a high dwell time – meaning the time customers spend in the store – of 27 minutes. Amazon is considering opening as many as 3,000 Amazon Go stores across the US by 2021, according to Bloomberg.